So I've gotten about halfway through the book, and OMG, this girl is stupid. 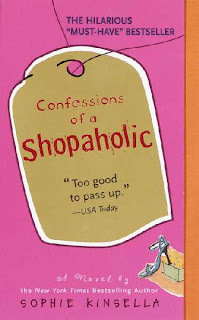 Maybe it's all this financial stuff that's going on in the world lately that's taking the fun out of this book, but seriously, what else are you supposed to think about a girl who actually ends up spending more money when she's trying to scrimp and save? Either you're supposed to find her antics "hilarious" (I fail to see what's funny about pretending to never get those collection notices) or you're supposed to empathize with her situation (the need to cut back on spending is understandable. The way she does it, is not.). If the latter's true, then I'm starting to understand how the world got into this financial mess to begin with. It's because I'm surrounded by idiots. And PS: I can't stop picturing the main character as Isla Fisher. and this is why i never finished the book. i wanted to kick her. i could not identify with her. i did see a preview of the movie and it does look adorable... isla fisher has that talent to make stupidity look cute. Sounds like my sister. Unfortunately not kidding. Oh, and she works in finance and investments. She actually IS good with other people's money, but has no personal control.